If you’re a fan of WMP, you’ll be happy to learn it’s still in Windows 10. Here’s how to find it and set it as your default app for your music and videos. When it comes to enjoying different forms of digital media on Windows 10, Microsoft includes Groove Music, Movies & TV, and its Photos apps. These are elegant apps that work well, but if you’ve recently upgraded Windows 7 to Windows 10, you might be more comfortable using Windows Media Player (WMP) instead. If you’re a fan of WMP, you’ll be happy to learn that it’s still in Windows 10. Here’s a look at how to find it and set it as the default app for your digital media. Note: Microsoft removed DVD playback support back in Windows 8, so you won’t be able to use WMP for them. However, there are plenty of third-party utilities (hint: VLC) that will let you play DVDs. For more on that, read our article: How to Bring DVD Playback to Windows 10. To find WMP, click Start and type: media player and select it from the results at the top. Alternately, you can right-click the Start button to bring up the hidden quick access menu and choose Run or use the keyboard shortcut Windows Key+R. Then type: wmplayer.exe and hit Enter. If you plan on using it a lot, you might want to pin it to the Taskbar while you’re here. 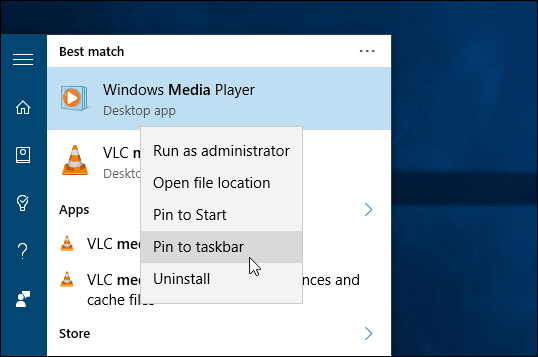 To do that, right-click on it and select Pin to taskbar, Pin to Start, or both. Windows Media Player hasn’t changed at all since its last update to version 12 in Windows 7. So, if you recently upgraded from Windows 7 to 10, and aren’t quite ready to use the new apps, you’ll be happy to see its familiar UI. Personally, I would have like to see at least a fresh coat of paint on the WMP interface. However, it’s obvious that Microsoft is phasing out some of its legacy software for the new universal apps instead. When you first dive into Windows 10, you’ll find that your media is already set to open in its new universal apps (Groove, Photos, Movies & TV.) But if you want to stick with WMP, you can set it as your default player by adjusting file associations. 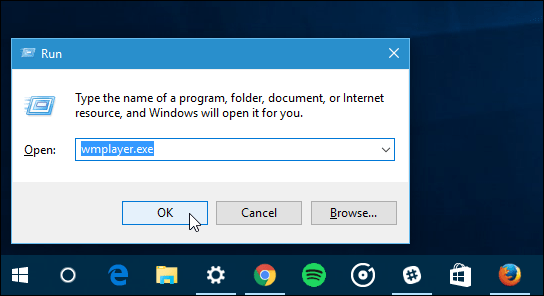 For more, read our article: How to Set Default Apps in Windows 10. It’s also worth noting that while DVD support has been taken away, support for FLAC and MKV files is added to Windows 10, and you can use WMP for that. 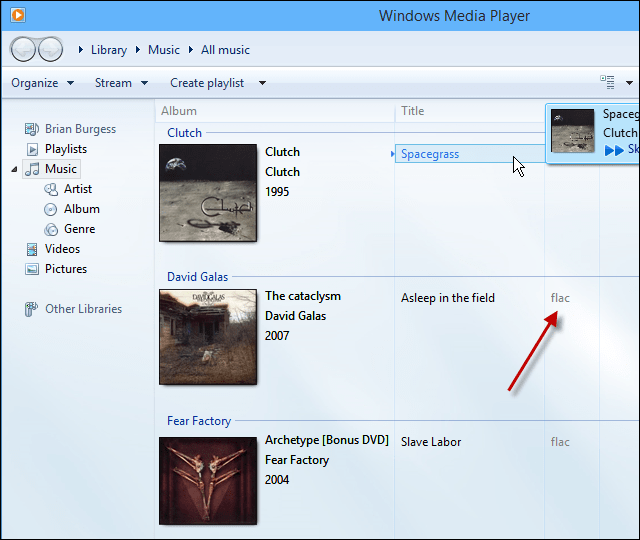 Do you still use and prefer Windows Media Player for music and video playback on your Windows 10 desktop? Leave a comment below and let us know your thoughts. 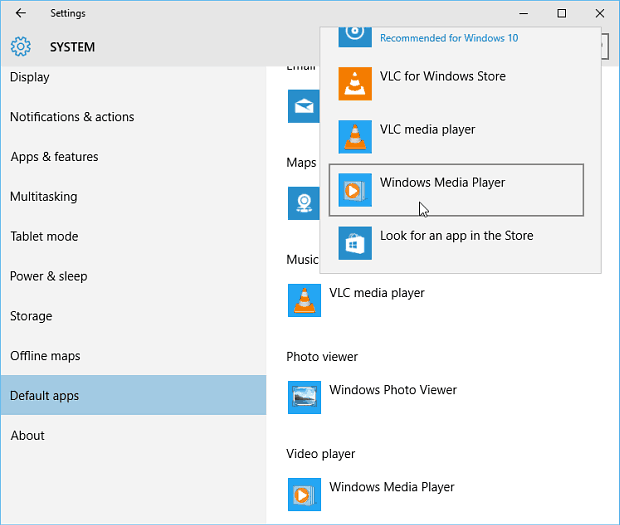 I cannot use WMP on my Windows 10 desktop to sync music to my Windows Phone 8.1 Lumia 1520. I could when my desktop was running Windows 8.1. I don’t know it that is a compatibility issue or something Microsoft no longer supports. *Windows Media Player does not recognize any devices. *The desktop itself recognizes my USB flash drives but not my Windows Phone. In Services, I checked Plug and Play, Portable Device Enumerator, etc. The services are up and running. It’s a mystery. Go to an earlier build if possible. It works fine for me and i upgraded to windows 10 from windows 8.1, make sure u find the file where the music is in and just copy and paste but syncing music from PC tp mobile phone works fine as well. WMP has been a die-hard app for many years. I still used it up to W-10. In the older days, I gained a quick fascination and appreciation for the more elegant Media Center app. Since WMC was dropped, I migrated to two other entertainment apps (for different reasons). They are the well known VLC Player and the up-coming FOOBAR200. I am finding that I have a greater appreciation for the higher resolution sound files (normally inherent within DVD movies and audio disks). Higher resolution files require greater effort on the part of the application and associated hardware. WMP does not always sound as good as FOOBAR2000 – I’m guessing this is due to the codecs employed by WMP. In any case, I still revert back to WMP simply for the sake of convenience and the speed used to open the app…I’m so impatient. I can open WMP (in Windows 10) using the “Run” approach but when using “Start” and then searching, it does not appear in the search results. Just VLC Media Player. I can’t find any way to pin it, opening it via “Run”. Another way I can force WMP to open, is by playing a MIDI file – this still defaults to WMP, I don’t know whether “Groove” and the other options with Windows 10 will play MIDI files at all. I would expect its icon to show on the Taskbar once you open it (through Run command OR via MIDI file). Right-click on the taskbar icon and select “Pin to Taskbar”. If you have a 64-bit OS, it’ll be both in “Program Files” AND “Program Files (x86)” .. Don’t ask me why.. If you can’t find it here either, It may also be in the Windows folder if you search for “wmplayer.exe” . The 64-bit version is 166kb, and the 32-bit is 163kb. Ignore all other results of much smaller sizes. in program files(X86) folder I found wmplayer.exe but it is 163kb in size for 64bit and yes its working fine. Please let me know if I am wrong..
i have windows 10, think i accidently deleted windows media player. Could anyone tell me how to download it? Thanks for posting this. I am getting ready to update from windows 7 pro to window 10… I hate that microsoft is remove stuff… But I know what is driving them $$. if the apps cost a ridiculous 15.00. Will this work also after the 30 days that you have to revert back to former windows. It states on the website the old system will be removed after that time period. I’m scared to death to install Windows 10 for fear of losing all the rare music I have in Windows Media Player. 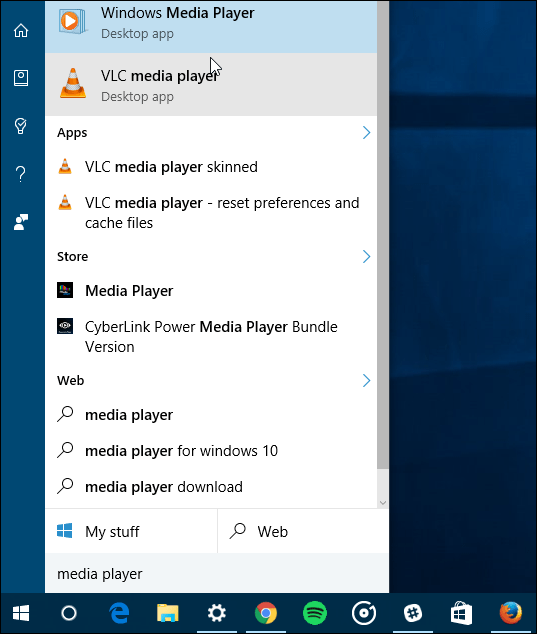 One expert says you can bring Media Player into Windows 10 and the next expert says you can’t. Who am I supposed to believe?? I will NOT give up Media Player until I have an easy-to-understand answer. I know something about computers but am not a whiz. Need simple answer. Thanks. Thank you, this was a very simple fix to get the media player to work. I have to say that I love the last screenshot because it shows “Spacegrass” by Clutch! Once again I am disappointed with MS.
they simply don’t care about users that want to stay using Windows Media Player. After my latest W10 update (middle Aug, 16) WMP does not run any more. I was in a middle of a reorg on my music library and I can’t continue it without WMP. Groove does not help me at all and I did not find yet how to put my WMP “back on business” or a good replacement. Thank you MS! That’s why so many people are moving to Google or IPhone apps. My Window Media Player stopped working over the summer. I tried all the ‘fixes’ online to no avail. With the latest update about a week ago, it suddenly started working again. My Playlists are all still in tact with all the songs playable but there is no music showing under Music. It says 3000 songs but 0 bytes. The music is all in my music files on my C drive, I just can’t get it load into WMP. I’ve tried add to Windows Media Player and that doesn’t work. However, I can play it as if I were going to add it a Playlist. It’s very weird and annoying, haha. Any ideas on how to get all of the music back into WMP? I can’t seem to get song titles on the CD’s I burn no matter what I try. I tried WMPCDText V1.4 – no joy for Win 10. I would pay a monthly fee or pay a one time charge if Microsoft would put Windows Media Player on Windows 10. I’ve tried several other players that are available in the apps list, but I haven’t found one that is as easy to use as WMP. Windows media player is my favourite app. Thanks for the great tips. Thanks alot, great tips, windows media player is indeed a great app. I have windows 10 too and, whenever I copy a CD on it, the copy appears to have recorded the music but it plays in a CD player without sound. what is that all about? it will play DVD’s provided you install a codec pack, example would be CCCP or K lite. I personally use MPC-HC for movies, which is similar to the original player. The only part missing for me is the television playback that was included in the windows media centre. And as yet haven’t found a suitable replacement. Absolutely LOVE WMP granted there are a few things that work different with Win10. It felt like learning a new app all over again, but am getting the hang of it. PREFER WMP. Maybe because it is like a nice comfy pair of shoes or maybe because all my music has so far worked quite well in WMP. SCORED today- a friend had the boxed set of Yes Years just laying out & as I was checking it out & commented that it was a sweet collection, -he says “You can have it” WOW! Am stoked & feeling privileged as I listen to it via WMP. Thanks for your info. Glad to have found your page -Thumbs Up. This is good to know that Windows media Player is still in Windows 10. I am currently still using Windows 7, which was a upgrade from Windows XP, the best one yet. Anyway I am pleased to learn that it’s still avaviable in 10. It’s the only defult music player I use. Thanks. Groove just turns me off with its soulless, unhelpful square. WMP has all those helpful menus and everything showing. Even a “play favorites” option ready to click on. I was loving having Cortana open it for me, and then after an update or something, all I’d get was a link to a Microsoft webpage about WMP! It didn’t show up on the start menu list of apps, either. Typing Windows Media Player into the regular taskbar search window didn’t help, either. This little trick did the trick! Windows Media Player is back! Yay! Thanks again! Groove doesn’t have the same abilities as WMP, for instance I listen to audio dialog at increased speed or watch training movies at 1.4 or 1.5 x normal speed. I don’t see that option in Groove or whatever they are calling their newest and less capable stuff. The graphic equalizer in groove has half the number of bands as WMP, I want more not less abilities. One would think the latest and greatest would have 1/3 octave and parametric abilities as well. Does any know if there are add-ins for Groove? I used to be able to import my music from media player to Roxio program to burn my CD’s with Windows 7. I Didn’t know that upgrading would wipe out my entire WMP library. I am now unable to import my music to Roxio with the “Groove Music” program.